Time to vote on your favorite! Except… we only have one entry. What happened to the folks who emailed and commented last year about their plans to make a gingerbread coop?!! We would have loved to see the coops you made. Rosella wins a signed copy of our upcoming My Pet Chicken Handbook (once it is released in February). And because she’s such a crocheter, I’ll also send her a free Mama Hen and Chicks customizable crochet pattern as a holiday gift. Congratulations, Rosella! You should have already received my email. Even though we can’t exactly discuss which coop should win the contest, please share your thoughts–maybe regrets for not entering?– in the comments. We will still give away a Raise Chickens! bumper magnet to a randomly selected commenter on this week’s blog post (you may comment more than once, but you will only be entered once). Comments must be submitted by midnight, December 26, 2013. The winner will be contacted via email, and you must respond within two weeks, or I’ll give your prize to someone else! 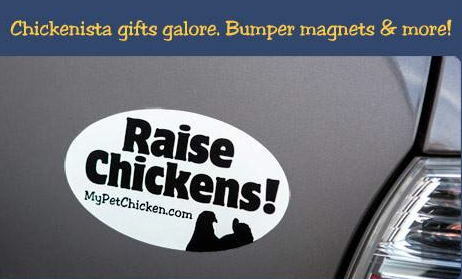 You can win a bumper magnet by commenting on this blog post! I love my chickens. I am mourning the loss of my Australorp, Gertie, who was plucked out of my yard by a Golden Eagle. I was in such morning that I could not bake a Gingerbread house in time. Just started our small farmstead in upstate ny and would live to have this bumper sticker on my car to encourage more people to produce their own food/eggs!!!!!! There are so many talented folks in the chicken keeping world. Seeing the entries has been fun! I wish I had known, I do cakes so u would have liked to try my hand at a coop, I did GB dog houses with the grandkids, fun! Hi Everyone! Thanks so much for your lovely comments Sarah, and Lissa too! I never expected to win (LOL! Not even by default!). LOVE my cute Mama hen & chicks pattern, and can’t wait to receive my book! Wow, if I had known about this I know my grandson & I would have been busily creating a gingerbread chicken cop / house . Congratulations to the winner ! Do you think you’ll be hosting this competition next year ? We love chickens and we love to bake !